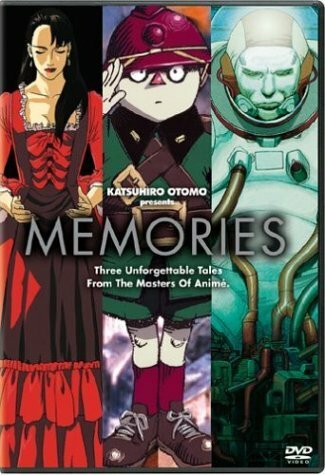 A series of three short films created by famous director Katsuhiro Otomo, Memories presents three different and memorable stories with their own astonishing and respective style. In this Dark Comedy, we meet Nobuo Tanaka, a young chemist with the case of the common cold. Nobuo unsuspectingly takes a pill that is revealed transform a person into an unstoppable bio-chemical weapon, knocking everyone and everything around him unconscious. The big problem is that Nobuo is to thick to realize it, and still attempt to travel to Tokyo by bike get some answers. However, this causes both the Japanese and U.S. military to scramble frantically to take down Nobuo before more people fall victim this unsuspectingly growing threat. What will be Nobuo's fate? And will he ever get smart enough to realize that he's the real "Stink Bomb?" He may have the entire country of Japan gasping for air. In the third short film we take a look at a futuristic militaristic steampunk society through the eyes of an optimistic young boy. The city houses a giant arsenal of cannons used to fire upon a rather mysterious and unknown enemy everyday. Many people living in the city cooperate to help the war effort, and children are taught to be the next in line to command them. But who exactly is this enemy that this city is fighting against?